Even though my back injury is still really bothering me, I went back to work with ice packs and a heat pack to rotate throughout the day. So far, it’s not worse, so that’s good. I am seeing small improvement with each day. I can’t believe it has already been 11 days since my injury. Recovery has been slow this time around. After a good ice pack chill – I put on a jacket and headed off to the co-op for my Fearless Fish class with Chef Dio. Traffic was horrible, it was raining – yes, raining in June for us is crazy. It’s also supposed to be 104 degrees by Monday. Make up your mind Mother Nature. 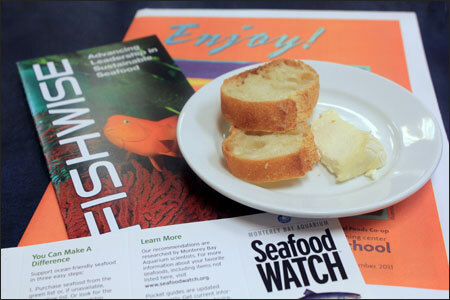 A small portion of the Fearless Fish class was spent talking about sustainable seafood. When you purchase seafood that is sustainably farmed or harvested, you are supporting the best practices of the industry that are designed to ensure a constant supply of seafood from healthy oceans. We were given color coded cards that outlined the best choices. Green = Best Choice – these species are from sources that are well-managed and caught or farmed in environmentally responsible ways. Yellow = Good Alternatives – are an option, but there are concerns with how they’re caught or farmed – or the health of their habitat due to human impacts. Red = Avoid – for now as these items are over-fished or caught or farmed in ways that harm other marine life or the environment. Download a seafood selector pocket guide from the EDF – Environmental Defense Fund website. Why does your seafood choice matter? Worldwide, the demand for seafood is increasing. Yet, many populations of the large fish we enjoy eating are over-fished and, in the U.S. we import over 80% of our seafood to meet the demand. Destructive fishing and fish farming practices only add to the problem. We were also given information that included a wallet card for seafood low on the mercury list. You can download a guide to protecting your families health from the Natural Resources Defense Council. If you are 150+ lbs., you should only be eating White Albacore Tuna (my favorite kind) every 9 days. I had NO idea. I knew it was higher in mercury levels, but there are actually fish on the list that you should only eat once a month, or in some cases, never. O.k. – back to the food and recipes. 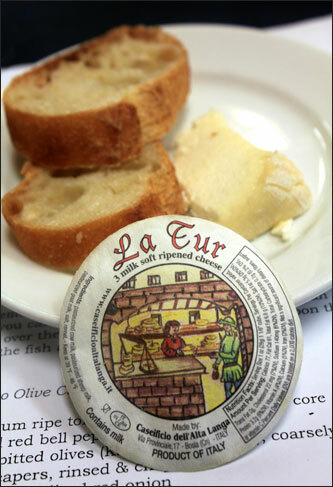 The La Tur cheese on our snack plates was fabulous! 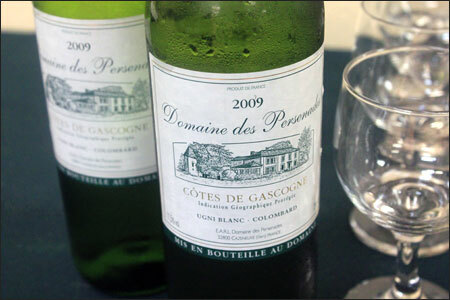 The cheese is made from a trio of milks – equal parts cow, goat and sheep milk. The resulting mixed curds are packed into small molds and allowed to age for 10 days. Our cheese was served at room temperature with crusty baguette slices. The cheese was buttery in flavor and super easy to spread, almost had a mousse like texture. I’m a huge Brie fan, but I will definitely look for this cheese next time I’m shopping at the co-op. 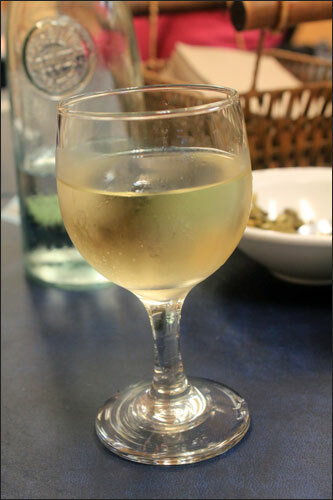 It went well with my back medications and fish ;). 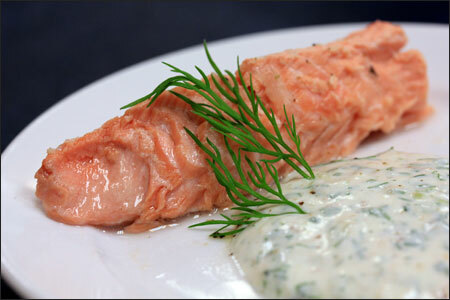 The first dish of the night was a Poached Wild Salmon with Yogurt Dill Sauce. The herbed sesame yogurt sauce was incredible – Chef Dio also suggested that it would make a good veggie dip. The poaching liquid for the salmon contained 4 cups of water, 1 thinly sliced lemon, salt, 1/2 teaspoon ground peppercorns (he used a mortar & pestle) to help release the pepper flavors into the liquid, a thinly sliced onion, 1 thinly sliced stalk of celery and 3 parsley stems torn into pieces. Combine all ingredients in a narrow/deep pan, bring to a boil – lower heat and simmer for a good 10 minutes. You will need to increase the time if the fish is cold. When you are ready to poach the fillets (Four 6 oz. boneless salmon fillets), bring liquid back to a boil, immerse fillets into liquid – if the liquid doesn’t cover your fillets, you will need to add more water. Lower your heat to low and poach for 10 minutes. Remove fillets from poaching liquid and drain well before serving. 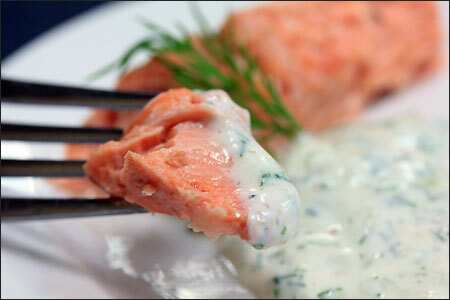 The salmon could be served hot or cold – I’m definitely going with the cold version – we had warm and it was delicious, but I really enjoy cold salmon with any type of creamy dill sauce. Combine the sesame seed coarse powder with remaining ingredients and mix well. Taste and add more salt and paper if it needs it. Chill and serve on the side of the salmon – If you put the yogurt sauce on top of the warm salmon, it will separate – It would be fine to put it on top of the chilled salmon. I pretty much wanted to lick my plate clean. I loved the flavor of the yogurt sauce and definitely will be making it again and again. If you are subbing a dried herb/spice for a fresh one it’s generally 1/3 less in the amount. Aroma – make sure your fish doesn’t have a strong fish smell to it. Make sure the texture is good. You don’t want to purchase fish that is falling apart. Fish have a lateral line – the nerve endings are used to detect movement and vibration in the surrounding water. Poaching liquid is also known as Court-Bouillon – Wikipedia definition: Court bouillon loosely translates as ‘briefly boiled liquid’ (French – court) or “short broth” because the cooking time is brief in comparison with a rich and complex broth and is generally not served as part of the final dish. I am now armed with 4 good fish recipes and I have Chef Dio to thank. I am realizing that my fear of cooking fish was more of a fear of buying fish. Now that I know what I’m looking for and now that I have more knowledge about the different cooking techniques, there really is no excuse for me to not cook/eat fish… at least a few times a week. I will keep with my fish series until I share everything that I have learned. Be on the lookout for a killer tomato, olive and caper relish recipe and a mirin sesame glaze that will literally have you licking your plate clean. Questions: Do you eat fish? What’s your favorite kind? I created this space to document my passion for hanging out in my own kitchen - trying new recipes or creating my own. I also enjoy exploring and blogging about new restaurants, wineries, breweries, food trucks, and local food events with friends. 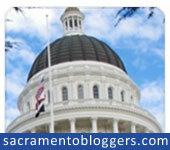 Thanks for reading my blog and giving me a reason to keep on writing.